After my most recent posts featuring two rice recipes in a row, a long exposition on milking a giant seed, and an attempt at de-freaking balut, it was high time I offered up some sweet simplicity. An opportunity to do just that came in the form of a standing invitation to the monthly International Incident, hosted by Penny of Jeroxie. For April's theme, we were invited to create Cake Pops, the roly-poly treats on a stick that many are calling the Next Cupcake. The invention of these bite-sized cake-and-frosting amalgams of adorableness is widely credited to blogger Angie Dudley of the extraordinary Bakerella, who has parlayed these relentlessly cute confections into a popular book and spawned an Internet universe of cake-popping. A fun way to express crafty creativity in edible form, cake pops are just as easy to make as they are to eat and eat. And eat. And eat. Easy to make, yes, unless you're a certain Unmotivated Noodle. With summer fast descending on Manila, I have been less than enthusiastic about firing up the stove or oven to cook, doing so only because Mr. Noodle can't live on Rold Gold pretzels and San Miguel beer alone (though he's indicated a much too eager willingness to try.) At the same time, I really wanted to join the fun of this International Incident Party and switch gears to indulge my sweet tooth after several savory-serious posts. Cake pops were just the thing, with just one tiny problem: what to do about the 'bake a cake' part? Although it gets a bad rap, laziness has its merits - for instance, it was the driving force behind my search for the path of least resistance toward cake-poppery. I did not want to bake, not even a boxed mixed as is often suggested. Solution #1: buy a ready-made cake. Unfortunately, it seems that bakeries hereabouts love chiffon cake - an admittedly delicious type but wholly unsuitable for the task at hand. Solution #2: buy cake donuts. Inexpensive and abundant, donuts were the perfect answer not only for accessibility, but also for portion control - I could buy only as much as I needed to make a small batch of cake pops. Having dodged the baking bullet, I turned my attention toward decorating; if I wasn't willing to demonstrate some creativity with the cake itself, then at least I could go all out in presentation. And so, may I present Cake Pups - motivated by a lack of motivation and sweetly inspired by a sourmug. Now, how's that for a recipe? Who better to explain cake pop-making than the woman who started the madness? Check out Bakerella's video tutorial for simple instructions on how to make cake pops. Our big bully was fawn (tan) and white with a dark muzzle, so I wanted to approximate his coloring for this cake pop tribute. But you can certainly switch it around using different chocolates and candies to make darker Pup Pops or even colorful canines. I did not actually make 'pops', as my first plan to use chocolate-covered cookie sticks, such as Pocky, failed (they snapped easily). I didn't have enough time to search for lollipop sticks, but will do so for next time. My one homemade element was the frosting - did I mention that I'm cheap as well as lazy? Imported canned frosting costs as much as an entire decorated cake, so I decided to make my own. The following yielded approximately 1 cup of frosting that was just the right amount for this batch. In a small bowl, beat cream cheese, butter and vanilla until smooth. Add 1/2 cup of powdered sugar and beat well, then add remaining 1/2 cup. Mix until smooth and creamy. Roll a cake ball and dip it in melted chocolate, per Bakerella's instruction. Place on a wax or parchment-lined cookie sheet and begin decorating: gently press a Gummi 'tongue' in the lower, center part of the cake ball. For the 'muzzle', press a pretzel over the tongue to keep it in place, then set a brown M&M in the small, center hole for its nose. Place 2 chocolate chips (pointy part in) above the muzzle for eyes and stick cashew halves on top for ears. For more cute confections, please visit the International Incident Cake Pops Party! PUPPIES! Soooo professional looking... they look so cute!! Oh my, between you and Conor we all should just pack our cake pops and go home! What a fabulous creation and I love that you are finding way to adapt your cooking and backing to your new surroundings! These are pretty damn cool. I didn't even notice the sneaky pretzel in there right away! Love that you get so many other extra treats to eat at well as the ball! 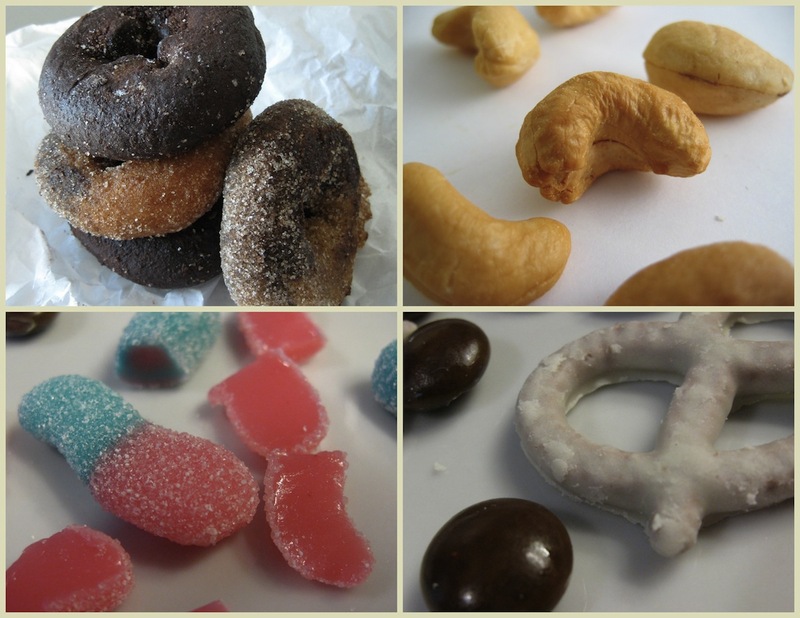 They turned out awesome & I love your idea of using donuts so you can just make a few. I bet the cream cheese frosting added a lot of flavor too. My WORD these are adorable! I love the doggie shape and using pretzels for the nose/face. You are a genius! These are so sweet - and such a wonderful tribute to Mr. Happy! sooooo adorable! I love it. Hello, Everyone! Thank you so much for your kind comments and I'm so happy that you enjoyed these little bulldog cake pops-without-a-stick! My sister arrived for a visit just before I posted and I've spent the past two days showing her around Manila. Now, we're off to spend the rest of Easter week with our family in the provinces, where I'm not sure if I'll have Internet access. So apologies if it takes me a little while longer to reply to each of you properly and to visit the my Int'l Incident Party-mates, but I will definitely get around to it. These are so precious. It would be such fun to make them for children. Hope you have a wonderful Easter with your family. Your cake pups are just genius, TN. Even in simplicity and (what you say is) laziness, there's that Noodle creativity and thoughtfulness at work. How cute are those guys?! A whole bunch of wee, edible Sir Cakehearts--love them! Hope all is well; haven't seen you on twitter in a few days. I'm having TN withdrawals. Take care! Oh, now I see you're visiting w/your sister! Hooray--carry on; enjoy the holiday! These cake pop puppies are just adorable! I will show these to 5 star junior in the morning, she would love them! Adorable! My daughter would go nuts for those. So creative. Who knew sweet simplicity could also be so much fun! We have international incidents in Vietnam, too, but of a, um, well, different type. I envy you your oven — not the natural outdoor one, but the one in your kitchen used to bake these goodies. I didn’t realize how reliant I was on an oven until I moved back to VN and couldn’t find an apartment that had one. Wonderfully creative Cake Pops, and a great story behind them, too! OOo, those are SO cute! Awwww, what a cute, not really lazy at all cake pop...er...pup. What an ode to a missed member of the family! As you can tell, I'm nearly a month behind in my blog reading!! These are adorable, such a great idea. I love that easy frosting recipe as well. They are so cute! What a fantastic idea! Oh Tangle, how I miss you! These are so cute...I have to catch up with you girl...how are things?